Rising rents are forcing many people in the UK to consider other options – such as becoming property guardians. They move into abandoned homes, maybe for a month, maybe for years. From the owner’s point of view, an occupied building is less likely to be burgled or destroyed; the guardians obtain low-cost accommodation. Safelincs works with a property management company that specialises in bringing together owners and potential guardians. There are thousands of empty properties in the UK, including flats, houses, churches, libraries and offices. They may be empty for many reasons – waiting to be sold, waiting for planning permission, or needing to be looked after while the owners are overseas. The property management company puts these buildings back into use, helping both the property owner and people looking for short term, low-cost accommodation. For some time, Safelincs has been providing bespoke fire safety equipment kits which the company issued to its live-in guardians. These consisted of a fire blanket, a fire extinguisher, a first aid kit, smoke alarms, a CO alarm, a wind-up torch and a bespoke fire action sign. The company recently decided to take its fire safety provisions to an even higher level and approached Safelincs to work out a solution. Risk assessments are now carried out on all properties where guardians are being installed. This assessment identifies the fire safety equipment required for each individual property. Safelincs then supplies the appropriate fire safety services and equipment including fire extinguishers, appropriate signage, smoke and CO alarms (usually radio-interlinked), door closers, fire door accessories and other fire safety equipment. By working with Safelincs, the company is able to create a more bespoke fire safety plan for each property. Safelincs provide sensible and practical advice for the safety equipment required at each location. Its role has become more that of a strategic partner than simply a supplier. In a continuing drive to remind people to test their smoke alarms, the government agency, Fire Kills, is introducing a brand new style of advertising. The previous ‘doom and gloom’ approach which focussed on fire related tragedies is being replaced by a more positive tone. The new adverts will feature ‘talking’ smoke alarms being friendly and helpful. 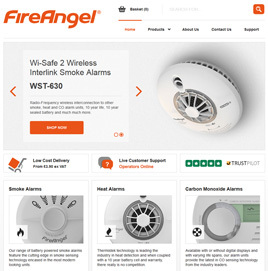 Insight had shown that people tend to dislike their smoke alarms – “they only go off when I cook toast” or “the low battery warning goes off at 3am”. 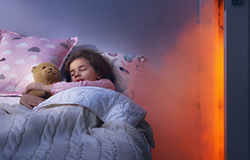 Under the banner ‘Unsung Heroes’, the campaign is a very different approach for Fire Kills as it moves away from fear to imagery that focuses directly on the smoke alarms. It is hoped that presenting smoke alarms as characters that are capable of expressing emotion and creating personalities for them allows people to relate to them. Fire Kills’ most recent strategy had been to link to the clock change, encouraging people to test their alarms while they move their clocks forward or back an hour – encouraging this behaviour by demonstrating the dreadful consequences that not having working smoke alarms can bring. However, changing clocks is less of a hook as timepieces increasingly change automatically and it was noted that even the weather forecasters do not always remind us now. Hence people need reminding to test their smoke alarms and Fire Kills now wants to promote more regular (monthly) rather than twice-yearly testing. Radio advertising will be the lead channel and will broadcast on Capital, Heart and Smooth radio networks from 11 January to 7 February 2016. Three press adverts will appear in the Sun, Daily Mail, Daily Mirror, Guardian and Daily Telegraph from 11 January 2016 to 6 February 2016. In addition Fire Kills will be trialling ‘Out of Home’ advertising with this new campaign including some large format digital advertising in seven locations across the country (Birmingham, Brighton, Bristol, Liverpool, London, Manchester and Portsmouth). It will also be supporting the large format digital activity with bus stop posters in pilot areas. These locations will be selected following analysis of campaign awareness levels and casualty data. Safelincs has been supporting Fire Kills initiative to increase smoke alarm testing for a number of years and offers a free reminder service with tweet or email notifications. Over 7000 emergencies attended by the fire brigade during 2013/14 were classified as chimney fires in the annual fire statistics report. Poor chimney maintenance is a known cause of domestic fires, most chimney fires are preventable. Chimney Fire Safety Week 2015 takes place from the 7th until the 13th of September this year. The event is intended to highlight the causes of chimney fires and emphasise how to prevent a chimney fire from occurring in the first place. The most common causes of chimney fires are inappropriately sized or poorly installed appliances, blocked chimneys from soot or bird nests and the burning of unseasoned or wet wood. The best way to protect your home is to have your chimney swept regularly. The Guild of Master Chimney Sweeps recommends that people burning wood or coal on a regular basis should have their chimney swept quarterly, whereas those burning smokeless fuel, oil or gas should aim to have their chimneys swept at least once a year. Infrequent sweeping of your chimney significantly increases the risk of a fire, and the consequences can be devastating and costly. Even a successfully extinguished chimney fire creates a great deal of mess and is a traumatic experience. Whilst having your chimney swept regularly will greatly reduce the risk of fire, it is still important to have a means of alerting your family in case fire strikes. Chimney fires are often reported as creating a disconcerting low rumbling noise accompanied by cracking and popping from within the chimney. If you are awake, these signs are often enough to alert you to the problem, but if you are asleep, your family are much more vulnerable. 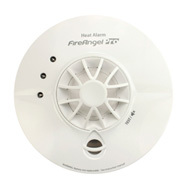 An interconnected system of smoke alarms will quickly detect any smoke released as a result of the chimney fire and raise the alarm across your entire household. Speed of detection is key, as a swift escape and notification of the fire brigade will greatly reduce the danger to your family and damage to your property. Your regular chimney maintenance and smoke detection system should also be supplemented by a carbon monoxide detector. Poisonous carbon monoxide (CO) is created by the incomplete combustion of fuels such as wood, coal & oil. If working properly, your chimney will draw the carbon monoxide away with the smoke. However, if your chimney is partially blocked, carbon monoxide can seep out into your home rather than being drawn away. Carbon monoxide cannot be tasted or smelled and has dangerous health implications, leading to many deaths every year in the UK. A house fire as a consequence of a poorly maintained chimney is a terrible thought, and should be enough to motivate anyone to take steps to protect their home from the risk. Having your chimney swept regularly, ensuring your smoke alarm system is in good order, and installing a carbon monoxide detector will ensure that you are giving your family the best possible chance of avoiding the dangers and trauma of a chimney fire. In a move to increase the safety of tenants in rented accommodation, a new law will require landlords to provide smoke and carbon monoxide alarms. The legislation, which is due to come into force in October 2015, is estimated to help prevent up to 26 deaths and 670 injuries a year. It will require landlords to ensure that a smoke alarm is installed on each storey of a premises on which there is a room used wholly or partly as living accommodation. This would bring private rented properties into line with existing building regulations that already require newly-built homes to have hard-wired smoke alarms installed. In addition carbon monoxide alarms must be fitted in any room which is used as living accommodation and contains a solid fuel-burning appliance. 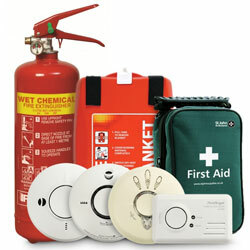 Prior to any new tenancy beginning the landlord will be required to ensure that each alarm is in proper working order. Testing regularly will remain the tenant’s responsibility. Those who fail to install smoke and carbon monoxide alarms will face sanctions and could face a civic penalty of up to £5,000. To ensure that smoke alarms are in a good working order and do not have their batteries removed by tenants it is best to install sealed longlife smoke alarms. 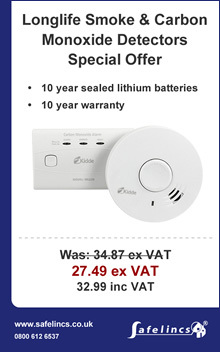 Safelincs also offers sealed longlife CO alarms, again assuring landlords the safe longterm protection of their tenants.